I’m now working on a HyperV migration project to move all servers from one datacenter to a new datacenter. This implies that I need to move all virtual machines with HyperV replica, configure virtual networks in the new datacenter etc. As I couldn’t reuse the old VMM server and config in the new datacenter for several reasons I have to re-configure the networking (Vlans, subnets, network sites, etc) configuration from scratch. So I found a way to automate all of this labour intensive tasks with Powershell. This blogpost is not about how to configure step by step networking in VMM, if you need more information on how to configure networking in vmm have a look here or download the Networking white paper from Kristian Nese . First of all the the script assumes you already have a Logical network defined using VLAN based indepentend networks. and Port Profile changed as well. So the next labour intensive task is to create sites,vlans, subnet, reconfigure the portprofile with new site ,create a virtual network etc manually. $NetworkName = "Contoso – Logical Network – Tenants"
$portProfile = Get-SCNativeUplinkPortProfile -Name "Contoso – Reference – Profile" -ID "a3c36703-4e0b-4b25-baa7-69b347be8c72"
#The Set-SCLogicalNetwork cmdlet changes the properties of a System Center Virtual Machine Manager (VMM) logical network object. #he New-SCLogicalNetworkDefinition cmdlet creates a definition for a System Center Virtual Machine Manager (VMM) logical network. The logical network can be associated with one or more host groups. 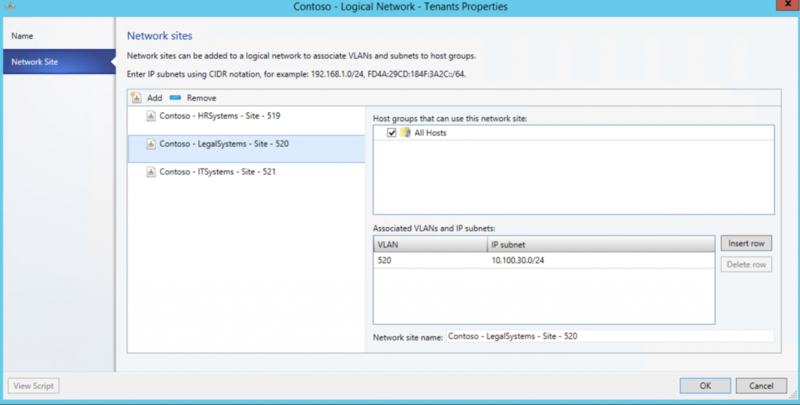 A logical network definition is also called a network site. #After you create a new logical network, use the logical network definitinon to assign IP subnets and VLANs to the logical network. $vmNetwork = New-SCVMNetwork -Name $VMNetworkName -LogicalNetwork $logicalNetwork -IsolationType "VLANNetwork"